Barbie's cute strapless navy and white striped cotton sundress features a full skirt and two ribbon bows - one in orange and one yellow. Her white open toe shoes completed the ensemble. The bodice has a snap closure in the back. 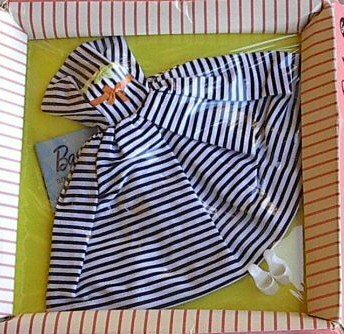 All Cotton Casual dresses should have the black and white fabric Barbie tag. The dresses made in 1959 will have a TM after the Barbie name. Dress made in 1960-1962 will have the ®. Although Barbie had several strapless dresses and several casual dresses her debut year, this is the only strapless casual dress in that first collection. These dresses are fairly easy to find – the navy and white striped cotton holds up very well. The areas most prone to wear – and the hardest to find in mint condition – are the ribbons that tie into bows. Frequently they will be broken, faded or missing.